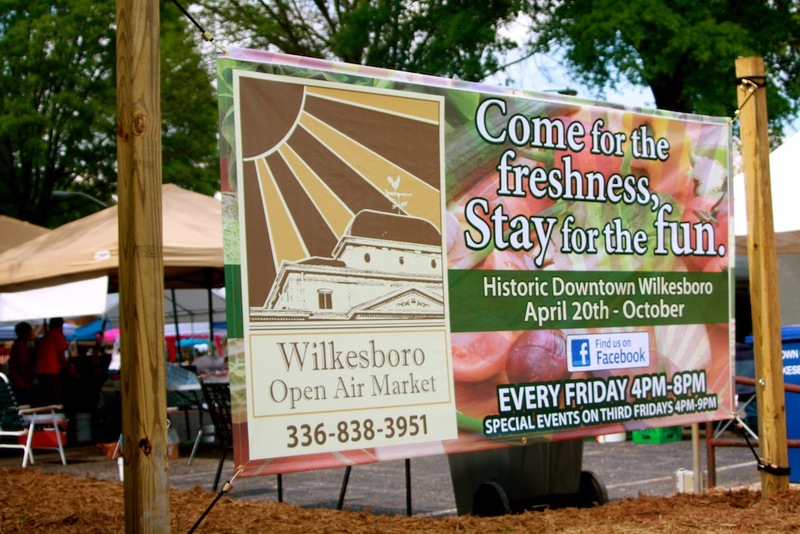 Each year the Town of Wilkesboro opens its’ doors to consumers, farmers and artisans to buy and sell at the Wilkesboro Open Air Market. “Fresh from the farm” produce as well as handcrafted products will be available every Friday for some 5 months (depending on the harvest). The market is located on Main Street in downtown Wilkesboro in the parking lot adjacent to the “old Courthouse” which now houses the Wilkes Heritage Museum. Vendors start arriving early and they open for business at 4 pm and stay open until they sell out or 8pm, whichever comes first. The Open Air Market offers a special event every third Friday…. called “Third Friday” J. During these events, the standard fare is available, but plan on some special things to be available. Additionally, local musicians will perform and there will be children’s activities available. The Heritage Museum will be open for tours during this time as well. As with other downtown festivals, parking is somewhat limited, but thankfully is in adequate supply. Take your time and cruise the area and look for the local lots or on-street parking. The crowds are reasonable, so no worries. Enjoy the walk and do a little window shopping while you stroll. There is parking around the museum, beside Nanasan Restaurant, behind the restaurant and of course on the streets throughout the town. Wilkesboro is the prototype small southern town filled with everything that makes small towns the place to be. The people are the nicest you will ever meet. The food is local “mom and pop” and tastes great. The service is excellent and you will be treated very well. The language is distinctly southern. Everybody will want to talk to you, if you are open to conversation. So enjoy the grits and grins and be sure to join right in. Toto, you are not in Kansas anymore. I arrived early, maybe too early; many of the vendors were still setting up. The market was not crowded and no one seemed to be in a hurry. Leisurely chats were in order at every booth. I learned about each person, how they farmed or made their product and what they had to offer. I don’t remember any of this at Wal-Mart J. Great looking produce, sweet scented soaps, goat milk cheese, handmade this and that, all waiting to go home with me. I watched a local blacksmith work steel. I had a wonderful coffee from Talia Espresso and sampled several flavors of things that had never been in my mouth before. All very good! If it is Friday afternoon and the Wilkesboro Open Air Market is open and you are looking for a great little outing, drive downtown and enjoy the evening. No stress, no strain, just good friends with wonderful homegrown or homemade items for you to try and buy, if you wish. Wilkes is nationally known for its’ music and the Heritage Museum is home to the Blue Ridge Music Hall of Fame (www.blueridgemusichalloffame.com). Be sure to check out those that have been enshrined in the Hall for their contributions to this regions music. “Third Friday” will feature some of the area’s finest musicians, many of which will likely one day find themselves remembered in the Hall. So, come on out and enjoy the music, food and fellowship, y’all will be glad you did.